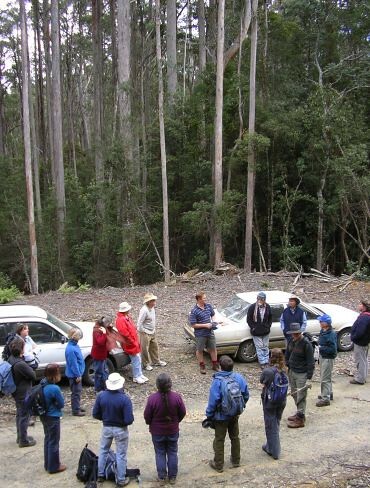 Mark Wapstra (in T-shirt) briefs us about searching for Thismia rodwayi in the forest at New Road, near Franklin in southern Tasmanian. Our first find! 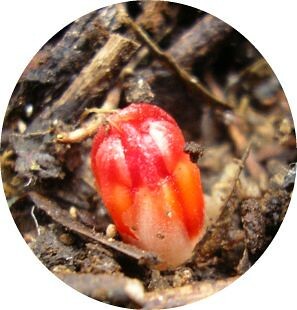 Thismia rodwayi bud, about 6mm across. It is normally hidden by leaf-litter and rarely seen. We found it by gently sweeping aside the leaf-litter in likely locations. 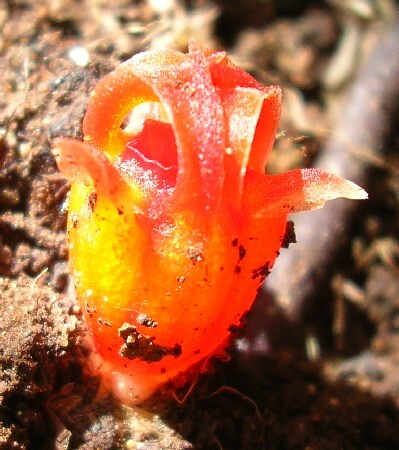 Thismia rodwayi in flower, sometimes known as fairies' lantern. Even when flowering it is still hidden beneath the leaf-litter. The fully open flower is only 12mm across. 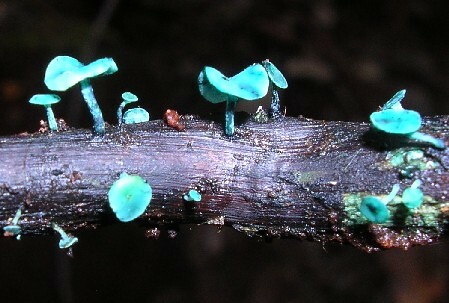 Chlorociboria aeruginascens fungi on wood. 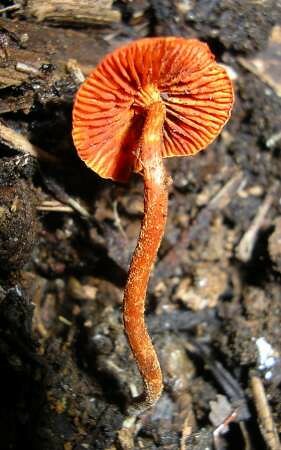 Cortinarius abnormis, about 20mm across. 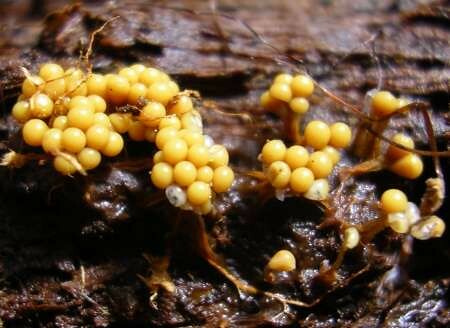 Fruiting bodies of slime mould Trichia sp., possibly verrucosa. 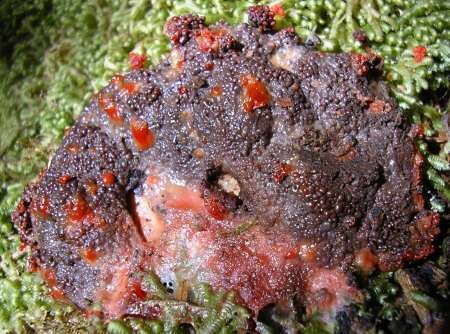 The spectacular amoeboid stage (plasmodium) of a slime mould that allows the organism to move and feed on moss-covered wood. 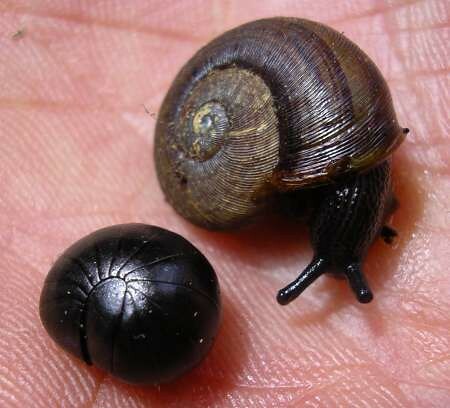 This snail is Tasmaphena sinclairi (also recently seen on our Milles Track excursion). The neatly rolled-up pill millipede is Procyliosoma sp. The taxonomy of pill millipedes in Tasmania has not been closely studied and, for now, all specimens can be assigned to that genus. This black-and-yellow millipede isn't formally named, but is known as 'Acuminosiphon mesibovi'. 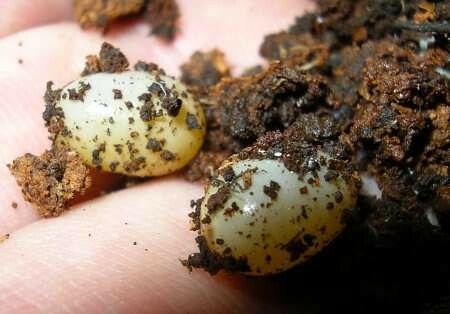 Eggs, about 8mm long, uncovered from rotting wood. 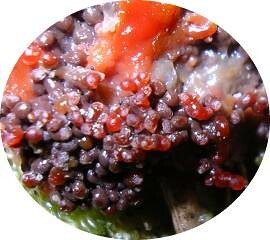 Are they skink eggs, or Caryodes snail eggs? 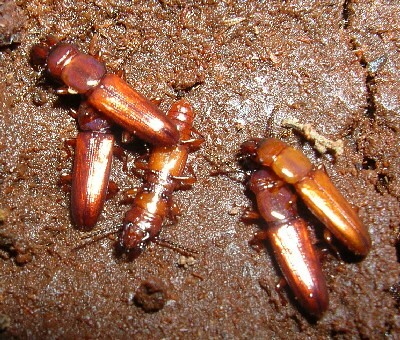 Prostomis atkinsoni beetles found under a rotting log. Microscope photo of the powerful wood devouring jaws of Prostomis atkinsoni. 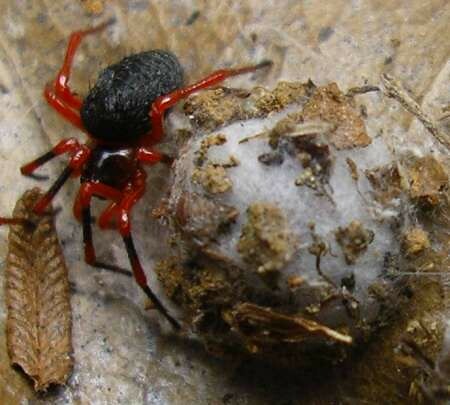 Litodamus olga (Nicodaemidae) female spider protecting its egg sack in leaf litter under Olearia argophylla. 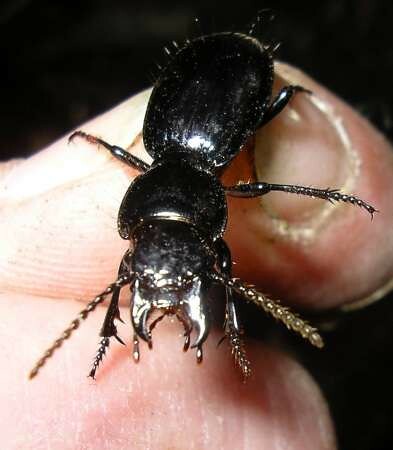 Percosoma carenoides (Carabidae) very angry at being held by the back foot! Eurispa vittata is an unusual chrysomelid leaf beetle living, in this case, on cutting grass Gahnia grandis. 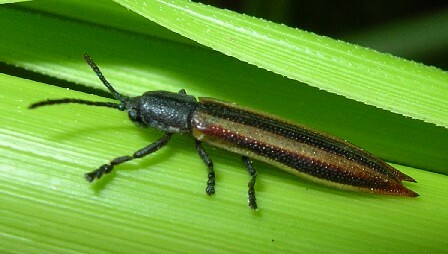 Larva of Eurispa vittata with its distinctive pair of long spines. 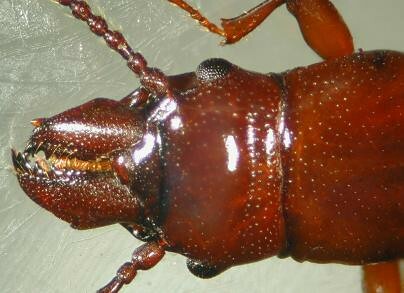 Note its clusters of simple eyes (ocelli) on each side of the head which later develop into the compound eyes of the adult. 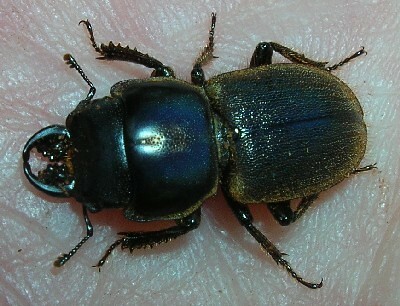 Microscope photo of Archemorus sp. 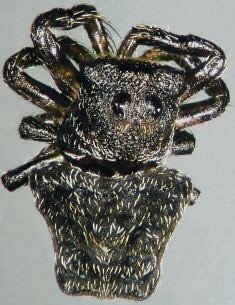 (Araneidae) 2mm long. These spiders don't really make a web. Instead they sit on a leaf (in this case Gahnia grandis), disguised as a bird dropping, and ambush their prey. 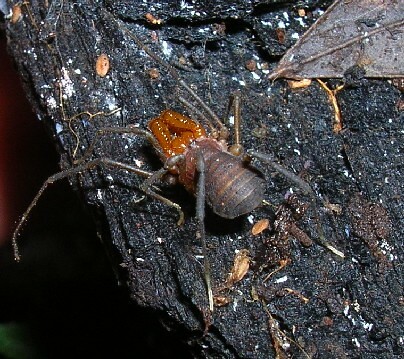 Note the large spines on the front legs.